The Rockford Chamber of Commerce (RCC) is a private, nonprofit, membership-supported organization. By consolidating resources from several hundred businesses large and small, the Chamber becomes an efficient and cost-effective resource for serving business members. We are comprised of businesses, organizations and individuals working collectively to build a strong economy and improve the quality of life in our community. It is one of the most frequent questions we receive. What does a Chamber of Commerce do? The Rockford Chamber of Commerce (RCC) works hard at “Building a Stronger Community. Together. We say “together” because we work with a large variety of businesses and organizations to bring many different programs to Rockford businesses and the community. We fill many roles as we do our work: information center, business spokesperson, economic advisor, professional developer, government relations partner, economic developer and planner, event organizer, and public relations specialist. The RCC joins forces with the City of Rockford and the Rockford School Systems to further the Quality of Life in Rockford. We believe in the 3-legged stool philosophy that says that there has to be equal support from all three areas to have a sturdy foundation and a stable community. All three are proud of the relationship that has been forged for the good of Rockford. It is the Rockford way. The Chamber features many programs and events that follow the vision of our mission statement. Among our programs, The RCC Scholarship and Chamber University help us to further the education of our community members. The Chamber Network Circle was formed to aid networking for our membership by fostering better relationships among our members. The many festivals and events the Chamber sponsors are a boon to both the community and the economy. To help its membership thrive in the business world, the Chamber offers Bi-Monthly Luncheons and After Hours events and SCORE Counseling. The Rockford Chamber of Commerce and its member businesses create a successful, profitable and positive business environment that strengthens and enhances the quality of life in the Rockford Area. The Chamber supports and advocates the growth of member businesses through member programs and collaboration with government, school and community organizations. We will act as trustworthy and responsible stewards of the chamber’s funds, seeking to direct resources with transparency, wisdom and integrity. We will treat all of our relationships with honesty, respect and fairness. We will be passionate about providing businesses with the tools they need to grow and prosper. We will be actively involved in our community because we care, and will be leaders in identifying and addressing issues of business and community concern. We will be open to new ideas and willing to consider change, to create value for our members. We will always work as a team and a focus on results are of upmost importance in our relationships with members, strategic partners, and the community. Blaine Kellermeier – Kellermeier Plumbing, Inc.
Vice President: Mark Roach – Wolverine World Wide, Inc.
Elizabeth Morse – Byrne Electrical Specialists, Inc. The event committees only meet during certain times of the year to plan their event. These Chamber events are highly successful and take a lot of time and dedication from the committee members. The planning includes every aspect of an event and each committee is headed by a chair who oversees the entire operation and hands out assignments. The longest standing event – the Santa Parade – will have been in existence since 1943. Downtown Rockford District Map – Discover all the shops and Restaurants in Downtown Rockford! Rockford’s downtown shopping district is a wonderful step back in time. And while it does not run seven city blocks, it will take an entire afternoon to make it through all the wonderful shops in our quaint town. Be prepared to be greeted by a smile as merchants welcome you into their family-owned businesses, eager to help you to find just the right purchase. The streetscapes are meticulously designed and lamp posts, clocks, sidewalks and benches join together to make your visit special. Rockford has everything to make your day complete. Whether you are looking for unique shops, dining opportunities or outdoor adventure – Rockford has the answer. Shopping – The downtown shopping district will be sure to delight you with its unique shops and boutiques. There are plenty of shops with exceptional offerings that range from boutiques and candy stores, to home furnishings and fishing tackle and even a toy store! The store owners are friendly, the atmosphere is relaxed and the variety is endless. Adventure – A river runs through it – and it is the mighty Rogue! You can kayak, canoe or tube down the rolling waters of the Rogue River. Is fishing more your style? Stop by the banks of the Rogue at any time during any season and you are guaranteed to find anglers and fly fishermen looking to land “the big one.” Go ahead, put on the waders and join them! If land is more to your liking, Rockford has hiking and biking trails – featuring the beautiful Fred Meijer White Pine Trail. Just visiting? The great thing is you can rent whatever you need to make your adventure complete. Food – The downtown district boasts many restaurants that offer a wide variety of dining fare and atmospheres – you can find one to suit your style and mood for each visit. Each restaurant has its own specialty and its own unique menu. You can find anything from custard in a cup along the trail, challenging yourself to get on the Hot Dog Wall of Fame, or enjoy a dining experience while relaxing by the banks of the Rogue. Festivals – Rockford is well-known for its festivals and events. From the fireworks and carnival rides at the Start of Summer Celebration to the beautiful fall days of Harvest Fest, Rockford is always highlighting fun for families. Rockford features the Rogue River Blues Series and Praise in the Park, which are FREE outdoor concert series during the summer. There is also the Rockford Farm Market every year from May through October. Art in the Park, a local artist event, features the talent of the area every year. There is always something fun happening in Rockford! What are you looking for? Rockford is sure to have the answer. Find all events here! 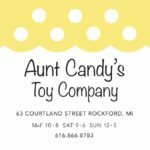 The City of Rockford offers a wide variety of stores, so whether you are looking for toys, yarn, home décor, designer clothing, fishing tackle, candles, grills, cooking utensils, or baby clothes – you can find it in Rockford. Each store is individually owned so hours vary according to the owner. Please call if you are interested in shopping at a select store to find out its hours of operation. Be sure to take time to visit the focal point of everyone’s visit, the beautifully landscaped Rockford Dam, which is sandwiched on the East and the West by Garden Club and Peppler Parks. It is beautiful throughout the seasons and is one of the most photogenic landmarks in Rockford. So much, in fact, that on any given day you will see wedding parties, high school graduates, newly engaged couples and families captured for history in photo shoots. Buy Local with the Gift Everyone Loves! We all have that one person in our lives; a person has everything or is impossible to find just the right gift. For those hard-to-buy-for people on your shopping list – and everyone else – give Rockford Cash! Rockford Cash is a gift certificate you purchase online and is redeemable at ONE of the many participating local businesses in the greater Rockford area (with more businesses adding each week). Since each certificate can only be used at one merchant, we offer different denominations to fit your particular gift-giving needs. Your friends and family will appreciate your thoughtfulness, and love choosing their own local gifts. Click here to purchase Rockford Cash!